There was a recent webinar by Maravedis-Rethink & EJL. The slides are available on Slideshare here. I think there were some good points made about using DAS or Small Cells for the Indoor environment. Here is the youtube clip. You can drag the pointer to the beginning, to listen from the start. Thanks Zahid for posting. I watched the webinar and I disagreed with the business case decision tree in the posting by Adlane. Did any one catch the comment about pole sway for E band PTP microwave links? I am currently investigating this issue. Looking for some good references or field results on this topic. I also think the presentation glosses over some of the difficult issues in installing and optimizing neutral host DAS systems. There are significant ongoing costs beyond install costs with DAS. We have been opting for single carrier pico-cell deployments over DAS when possible. You are absolutely right regarding E-Band radios for small cell backhaul. There are a lot of OEMs working on the radios either proprietary PHY/MAC layer or by modifying 802.11 ad for PtP purposes. Regarding neutral host DAS, yes optimization of multi band, multi technology, multi radio and multi-operator DAS with e-911 for all the WSPs is a real challenge and a lot of cost involved. 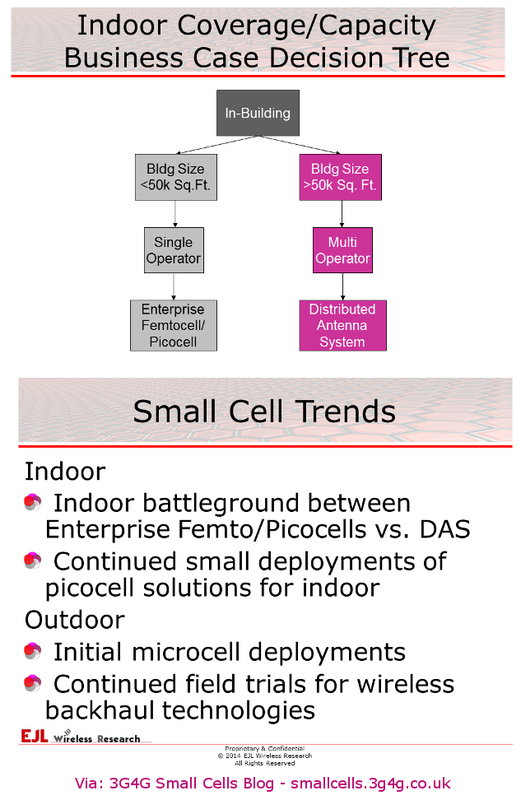 The preference you have mentioned for single carrier pico Cell is probably the best approach when the demand is low. If you consider 40,000 viewers in a watching a game and assuming 30% belongs to "A service provider", a single carrier pico cell solution wound not be sufficient. Please share your ideas. All indoor and outdoor small cell products are being developed with integrated Wi-Fi AP's. Why? Is the small cell service going to be the preferred service for the carrier and Wi-Fi going to be the best-effort service for neutral host offerings? Or is Wi-Fi the hedge by carriers to protect their investment and enable for new business models now emerging in the market? Thanks Tom for bringing a very genuine concern. As of now, not a single small cell deployed has WiFi. There are few small cells in the Lab for 2015 deployment will incorporate WiFi. Actually WiFi chipsets are cheaper and the WSP already has a Backhaul Internet connection up to the small cell, then why not to provide WiFi to offload some part ( OR a major part of traffic) , then over all capacity of the small cell will be higher. IMHO, WiFi will be best effort. Tom, great points and yes the carriers are hedging the bet on WiFI and it will come eventually. Manoj is correct in pointing out that WiFI is an overall cheaper solution and their will eventually be a convergence in that technology. It makes sense.